Today I decided to try a new sauce. I remembered being told about Siriacha mayo sauce, but I didn't actually know what was in it besides mayo and hot sauce. Turns out, that is pretty much all it is. I looked into a few recipes and they were all slightly different variations of this simple recipe. After about an hour of looking through different variations of the same thing I decided to try and make the original version of this sauce. Very simple, very creamy, and has a very nice kick to it. Only problem I had with it is that I didn't have anything with it. 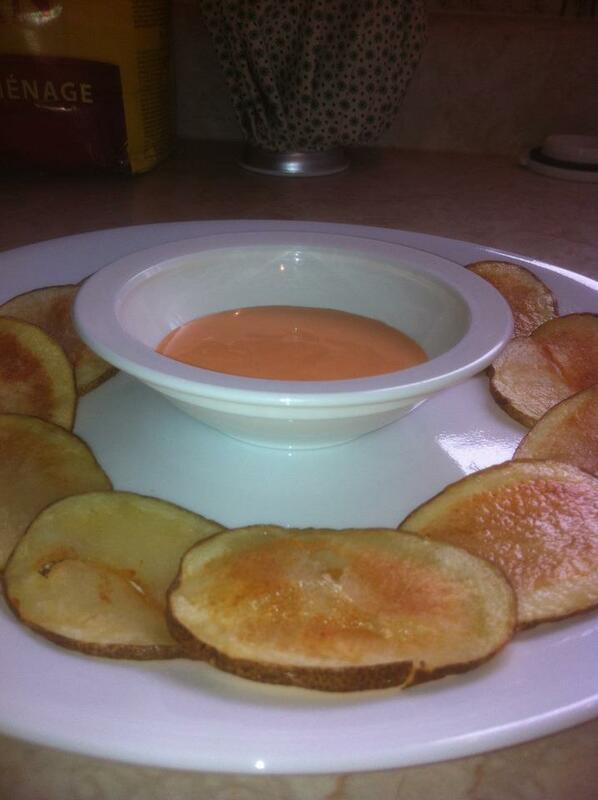 I soon decided to slice up a potato to make chips with this sauce. The reason I thought of chips being the perfect counterpart to this dish was because of the sauce for some reason reminded me of a ranch dip, only with a kick. I don't know, maybe it's just me. 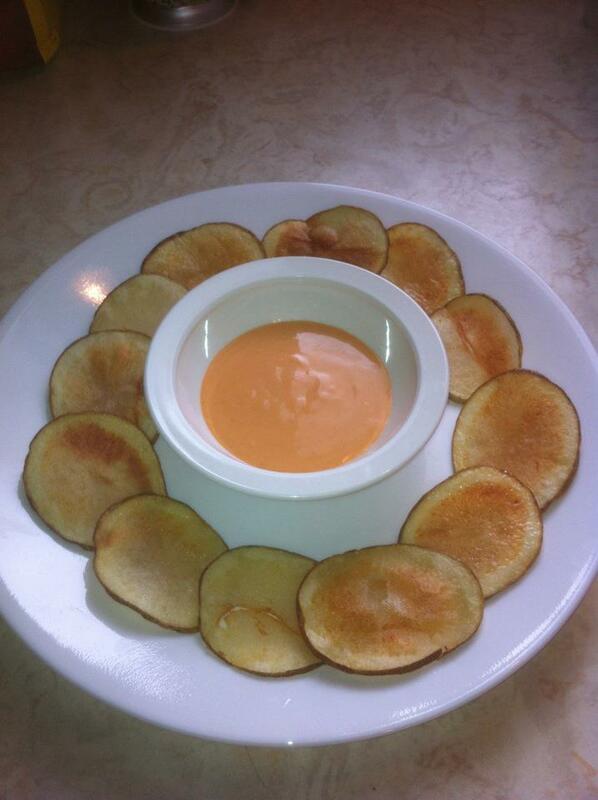 Anyhow, the sauce/dip made a very great condiment for the chips. This dish ended up being very good. I soon thought of other things I could use this sauce on. Then it hit me. I'll make a sandwich and use the sauce to accompany it. Unfortunately I didn't have sandwich meats. Which is great because I like real sandwiches with real meat and not that possessed stuff. I also came to the conclusion that this sauce would also be great on veggies. 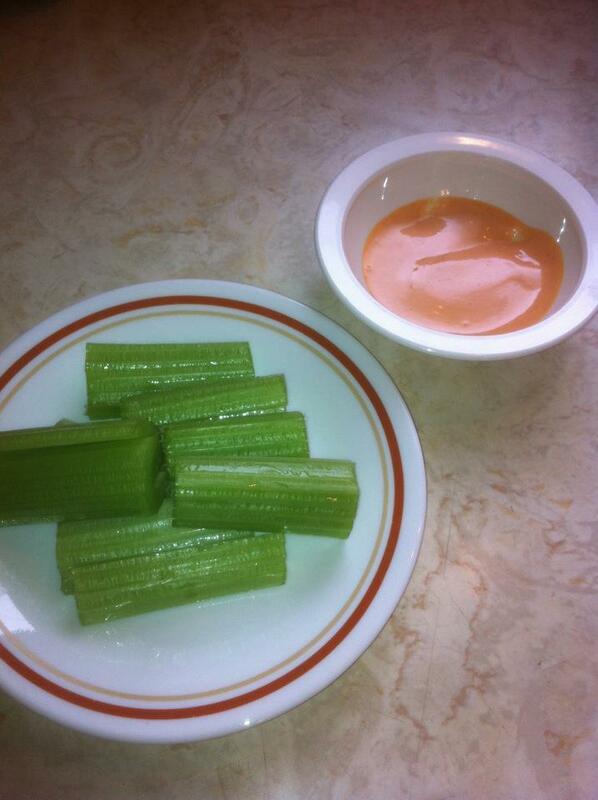 So to quickly test that theory I cut up some celery to munch on. I used the dip with it and I was pleased to say that it goes really well with vegetables as well. This is defiantly a great sauce to add to my list. I am looking forward to seeing what else this sauce will go with. This recipe was really quick and really easy to make. The sauce itself took only like 5 minutes to whip together. I would like to warn some people though, If you can't handle spice then you probably won't like this. Also you can make it so there is less hot sauce which is another great thing about this recipe. It can easily be modified to make it less intense or more intense. It is also really easy to modify the recipe to make it your own. This is definitely a sauce worth trying. Full Recipe at http://www.CJSFood.com/ or you can also find it on our Facebook Page. We hope you enjoy this and other great recipes at C.J. 's Food. - C.J. Bevan. Any Questions? Or Requests? Send us an Email to ourblog@cjsfood.com.